Racial Hostilities: Kobolds, goblins, hob-goblins, orcs, ogres, trolls. Dwarves in general are annoying; individuals can have merit. Sentiments/Western Empire: A foul place with callous and self-obsessed pricks, like the Elves of old. Sentiments/Dominion of Man: In a world full of beings too large by half, the majority of the ones you can stand to be around seem to live here. Disposition: Determined, patient, goal-oriented. Doesn't back down without excellent reason, refuses to sell himself, er, short. Description: Jakkin is a tall, broad-shouldered, handsomely muscular young man -- at least, by the standards of his species. While not even waist high on many races, his demeanour nonetheless indicates that he doesn't consider himself lesser. His pale hair and beard are both worn long and rugged, and when exposed there are numerous well-healed scars visible upon his skin. The Red Claw tattoo of the Red Brigade is one of a number of designs inked into his skin, albeit one that is featured prominently upon his upper arm. Precision Sharpshooting (special): +20% on Perception Rolls to calculating all the variables in making an aimed shot and identify­ing the right moment to make the best shot. It requires a "Called Shot" and counts as two attacks, but the marksman is able to shoot 20% farther without penalty, is +2 to strike on a carefully aimed, Called Shot. Makes a Critical Strike (double damage) on a Natural 19-20, if he so desires. +20% on Perception Rolls to identify the type of ranged weapon and ammunition (if appropriate) of the weapon used based on the "signature" it left behind (size of hole, blast marks, etc.). Marksman Sharpshooting (special): +2 on Quick Draw initia­tive - drawing, aiming and shooting his weapon, probably from the hip, before his opponent. Roll 1D20 for QD initiative to see who draws and shoots first, then roll 1D20 to strike. W.P. Knife - +4 to strike, +4 to parry, +4 to strike when thrown, +2 to damage. W.P. 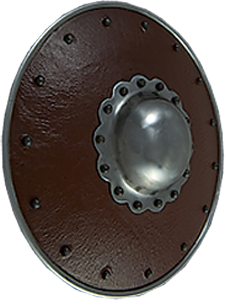 Shield - +2 to Parry, +1 to strike with shield. W.P. Sword - +2 to strike, +2 to parry, +1 to strike when thrown. Last edited by Jakkin Longshanks on Thu Sep 06, 2018 3:29 pm, edited 32 times in total. An ancient weapon crafted by Kobolds, its design is to equalize the playing field between them and their often much larger foes. ☞ Adaptive engineering: can also use regular crossbow bolts, but with no knockdown effect & half-damage. ☞ Knockdown Effect: Human-sized beings who are shot must roll a 20 sided die to maintain their footing. This balance roll must equal or surpass the attacker's natural roll to strike. A successful save vs knockdown means the character feels like he's been kicked, but remains standing and suffers no penalties, except he loses initiative if he had it. A failed roll means the victim is knocked off his feet, and falls back onto the ground (1D4 feet), loses initiative (if he had it) and loses one melee attack/action! Even characters in full body armor will be knocked down, however, giants, supernatural beings and creatures of magic are not. • Modifiers: -2 Speed, -55% to prowl and-20% to climb/scale walls and swim; Gnome-sized. • Attachment: Extra quiver of 15 mundane bolts. • Damage: Can be thrown about 15', inflicting 1D4 damage. A shield-bash does 1D4 damage. • Features: Subtract 10% of the damage that would normally be inflicted by a weapon when parried by a shield. Damage: Kicks: front does 2D4+2 points of damage, rear does 3D6+6 points of damage: bite 1D4 damage. Natural Abilities: Nightvision 40', sure footed, excellent balance, swim 60%, leap 4' high & 8' lon, carry up to 600 lbs. or pull up to 4,000. Speed: 27, but maximum speed is 44; that speed can be maintained for 4D4 minutes. Average Life Span: 10-12 years. 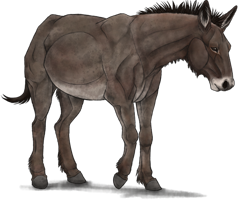 Behavior: As social animals, they work best when pan of a mule train. The mule has the donkey's stamina and the horse's strength. which enables them 10 carry heavy loads without tiring. They can be stubborn. especially if used as an individual or pair of work animals. Last edited by Jakkin Longshanks on Wed Sep 05, 2018 7:06 pm, edited 18 times in total. The Aushalten Clan, still living in their ancestral Gnomish home in what is now referred to as the Old Kingdom Mountains, have their traditions. With their long lifespan, Gnomes spend many years developing each stage of their life, rather than rushing from crisis to crisis as many of the Younger races do. A Gnome isn’t considered to be fully adult and ready to shoulder the responsibilities of such until eighty years of age. Marrying before one hundred is considered to be scandalously young, and new couples typically spend at least twenty five years with just each others’ company before starting a larger family. Children, when born, are given the focus of love and attention for the first ten years of their life; no further children are sired during at least that time, and often for longer periods afterwards. Since Gnomish fertility begins to fail somewhere around the two hundred year mark, most families consist of three or four children, with upwards of seven happening occasionally, but rarely. Thus enters the Siebtersohn Prophecies. Any family having seven sons is a rare thing. That seventh son also having seven sons is the next thing to unheard of. The seventh son of seven generations of seventh sons? That child would be destined for greatness. Which brings us to Jakkin Orensen, born under the sign of the Pegasus, the seventh seventh son, universally acclaimed from birth to be a hero of their people. And he almost immediately seemed to be well on his way to living up to their expectations. He grew tall, strong and handsome, a towering build for a Gnome, and showed both a keen intellect and a strong force of personality. He had all the elements of a hero, which was something his people were in sore need of; as the centuries had passed, their home had been pressed with increasing aggression from the Kobolds that also inhabited the mountain range. While the Aushalten were a numerous people, some three thousand strong, they were looked upon as tasty prey by the Kobolds, who would raid the perimeters of the clan’s caverns whenever they thought they could get away with it. The cramped confines of Gnomish tunnels restricted the access of the larger humanoids, as well as the armed and vigilant border patrols the Gnomes mounted to prevent these incursions. While clearly destined to be a front-line fighter in those patrols, Jakkin had his early life learning to grow through before he could be considered a warrior. Having been enthralled with the waist-high terrier breeds raised for companionship and combat support in the tunnels, he spent several happy decades amongst the dog breeders and trainers, learning the craft. While the clan was to a large degree self-sufficient, with small crops and herds raised in sheltered valleys in the mountain range, there were additional factors and supplies that required them to occasionally trade with the larger outside world. Most of the Aushalten never saw more than their own kin and the occasional Kobold during a raid, but the senior traders and merchants who would travel to the lowlands would bring back their tales of the giants and monsters that inhabited those lands. Nearly the size of some of the towering Kobolds himself, Jakkin doubted the accuracy of these clearly inflated ‘tall tales‘ that were brought back to them. As he grew closer to his Age of Adulthood Jakkin’s weapons training began, and he took to it with determination, enthusiasm, and not a small bit of talent. Learning the light, quick blades that best served the Gnomes in their tunnels and the crossbows that could skewer a Kobold from a safer distance, Jakkin demonstrated that with sufficient practice in these weapons, he could become a force to be reckoned with indeed. He eventually began to accompany patrols; not as a combatant, but as a supplyman. He wasn’t to do any fighting himself, but to provide replacement quarrels or blades to the fighters in the event of a Kobold skirmish. There were, a few, and he acquitted himself well; neither becoming flustered nor overstepping his responsibilities, showing the mien of a serious, dedicated soldier. Which was why, when the end came, it was all that more of a crushing blow. The pressure and ferocity of the Kobold raids had been increasing over the past century or two, as the local swarms greedily expanded their territory. The Aushalten had responded with increased vigilance in their patrols, but the fatal blow hadn’t come from their borders. Without absolute certainty, the best guess the survivors could make was the action of several Warlocks with earthen powers being assembled by the Kobolds in an unprecedented action. The small vertical shafts that pierced the hall roofs to the outside for ventilation had been magically enlarged, and scores of Kobolds had poured down these chimneys bringing with them the gifts of death and destruction. Entering well behind the patrol lines, into the heart of what should have been secure territory, the unprotected Gnomish people were hopelessly over matched by the larger, stronger Kobolds who for once had plenty of room to maneuver. By the time the invaders had been driven back – and they had been driven back, the hastily returning patrols couldn’t even manage to drive them back – over a thousand Gnomes had lost their lives, many of them still considered children with no training to defend themselves. It was, without question, the single largest disaster since the Elf-Dwarf war of eighty generations ago. And, as it turned out, it was the end of a people. Fully half of the Council of Elders had perished, and the remaining made what they saw as an incredibly difficult decision, one that had been talked about quietly in councils already, but was now seen as a harsh necessity. The Kobolds had proven they could, and would, wreak great havoc among their peoples, carting away many of the dead to feast upon. Their way of life, clung stubbornly to for countless years, could no longer continue, not if they were to survive. The clan would leave their mountain home, descending to the plains and taking up residence in the Lands of Man. All of the clan were stunned, Jakkin no less than the rest of them. Their home, their way of life, all was to be wiped away to start anew in a strange land among strange peoples. Unthinkable...except they must, for to do otherwise would inevitably mean death. The sight of the train of refugees, personal belongings and valuables packed up to never return, cracked something within young Jakkin. The clan – barring a few die-hards who had refused to leave, dooming themselves to Kobold cookpots sooner than later – descended in good order into what Men called the Timiro Kingdom. Everything there was strange, and bright, the views far too vast and wide, the fauna immense beyond belief. Jakkin swiftly discovered first-hand that the tall tales of the merchants, now leading the way to this new, strange life, hadn’t been tall at all. Or, rather, the height had been entirely justified. Dwarves were huge, as large as Kobolds but twice as broad; Humans towered two to three times the height of a Gnome, and Elves were taller yet. And those were the races that were generally positively disposed toward he and his kin. Some of the monsters were a magnitude larger yet. And yet this world was safer, as they came to settle in the shadow of Men. Their travels eventually brought them to a good-sized city, one which the master merchants had contacts within. They negotiated a settlement within this collection of large beings and unbelievably massive construction, and even the most dubious among them could see that it would take an army of large proportions to give this walled and defended city any cause for concern. No, the danger, when Jakkin finally came to see it, had been far more insidious. The Humans had been cheerfully polite and accommodating, endlessly fussing over their adorably cute little neighbours. There were difficulties fitting into this new society, of course; nothing had been designed for their stature, from work surfaces to tools to even the beasts raised for burden or food. Some of the dogs alone had been bred to unbelievable size; the horses, cattle, and a massive beast called an ‘ox’ were almost too much to credit, let alone handle with any degree of ease. Not to say there was nothing that could be done, of course. There was work that was better suited to the relative size and strength of the Gnomish population, but it didn’t take long for Jakkin to realize that it was, in Human society, children’s work. Running this, fetching that, sorting things that small fingers could do well and little of great import. A few of the craftsmen who worked in more delicate fields – their surviving silversmith, for one – could contribute in much the same way as they always had, but most of their people were relegated to learning new ‘jobs’. And as for the scouts and warriors? The Humans clearly saw the concept as endearingly amusing, and assured the Gnomes that while they had the city defense well in hand, they would be sure to call upon the Gnomes if they needed their assistance. It was…fairly obvious that this would be a hollow offer, from the perspective of the Men. This, of course, did not thrill Jakkin to any great degree, but there was little he could see to be done about, and the Elders assured their people that they just needed to exercise patience, the Humans would see the merits of what they could bring to the community in time. Jakkin himself bartered his experience in canine husbandry into a job working with the breeders of the huge shepherd dogs that worked the flocks and herds. Dealing with the young pups, of course, something befitting his...stature. Jakkin gave it time, as the Elders had implored. But what he saw wasn’t an impressing of the Humans of Gnomish capacity and ingenuity; what he saw more and more were Gnomes, treated as cute children and given a child’s task, beginning to act like children, and seem grateful about it. That undefined something inside him, cracked upon the exile march...shattered. Gathering clothing and some personal belongings into a pack, he collected long-disused sword and dagger and departed without a word to his people, setting their broken home and broken culture aside. He fell in behind a group of red-cloaked mercenaries who had always been treated with, at the very least, grudging respect when they had passed through the city, and refused to be left behind. After two days of jokes, catcalls, and overt betting as to when he’d give up and fall behind, he was invited to join their evening fires. This was his first official introduction to the Red Brigade. Entertained by his determination to join their ranks, he was sent on to their training grounds with a letter of introduction from the platoon’s Lieutenant, recommending that he be given the opportunity to prove himself. As Jakkin soon discovered, this hadn’t been a particularly magnanimous gesture on the Lieutenant’s behalf, as the Red Brigade’s method of winnowing out the unworthy was harsh and very effective. The young Gnome didn’t win any friends on the multi-day hike that had many of the potential recruits hobbling from blisters and throwing up their dinners. The training Sergeant very quickly began pointing him out as an example to anyone who started to flag, extorting them to pick up the pace; even the godsdamned tiny Gnome was doing it, surely they could too? The pace had been gruelling, the days long and the terrain unforgiving, and Jakkin had steadfastly refused to give in no matter what pains and exhaustion came to him. It was clear that everyone expected him to fall behind, and he would Not. Let. That. Happen. He did, eventually, make it through to the end, albeit not in what anyone could even generously call good shape, and had earned in equal measure smouldering hatred and grudging respect from recruits and veterans both. It was, as well, on that run that he earned his sobriquet of ‘Longshanks’, one that he embraced as a replacement for the one that no longer held any honour or respect from him. Well. He always took it personally, but he learned to turn around and demonstrate that the fact that they were bigger didn’t automatically grant them the status of better. Oh, quite often someone was better, but he worked damned hard to make sure it was due to greater skill or experience, not merely brute power and excessively long limbs. It helped that he did, indeed, have a great deal of potential, factoring in his size. He applied himself with a will, and picked up his instruction with varying degrees of swiftness. He refused to shirk on the battlefield, throwing himself into the thick of thing with as much enthusiasm as any and more than some. He was often discounted in favour of greater perceived threats, and he didn’t hesitate for a moment to take advantage of that error in judgment. A twelve inch blade can find and pierce a heart just as lethally as a three foot one, some foes came to learn…if too late to profit from their lessons. The training cadre of officers and non-coms didn’t let these events pass unobserved, and since it seemed that his diminutive stature was actually helping him in a way, rather than hindering him, they quickly plotted tactics to take advantage of this. The sight of a Gnome-lead charge was often enough in and of itself to shake an enemy force off their rhythm, and if he was ignored in favour of the much larger warriors in his wake, he soon taught them the error of their ways with a series of hamstringing blows from behind their lines. He took his share of injuries; survived them, healed them, and learned from them. He was good at surviving, and he didn’t question why; he was the Siebtersohn, and he was destined for greater things than dying in a minor skirmish with Orcs or Wolfen. He might not know what that destiny was any longer, in the wake of such a vast upheaval of life and culture, but he yet had a destiny awaiting him. It was during this time that solidified his service to the Archaic denomination as well; Aco the Mother spoke to him as one who was a refugee and has known persecution; The Juggernaut was the clear source for his indomitable will and unusual power for his size. He offered prayers and devotions to his patron deities, and turned that faith into further drive to realize his potential. After his first two years of service with the Company, the brass decided that if he was going to make a habit of being passed over for more dangerous-appearing targets, they should take advantage of that fact and insert him into the command structure. Thus, Corporal Longshanks found himself with a small portion of command responsibility in his small hands, and any new additions to his squad who had issues having orders relayed to them by such a diminutive figure soon discovered reasons to be a little more accepting of the way of things. Given a certain degree of temper and a decidedly large chip on his shoulder about not being very large, Jakkin was often found brawling with his fellows, whether it be in formalized training sessions or the occasional ‘unauthorized’ scuffle that could happen out of sight of the senior NCOs. Despite being at a significant size disadvantage, he nonetheless often gave a good accounting of himself, using an opponent’s preconceptions and leverage-irrelevant joint locks with equal ruthlessness. Regardless, once his initial five year tour was coming to a close, the company commander offered him a deal; if he re-upped for another tour with the Red Brigade, they would put him through some advanced training in ranged, armed, and unarmed combat. Already strongly considering re-upping, Jakkin took the deal. The training was intense, and took over half a year away from active contracts and the potential loot that came with them. He never felt the time was wasted, however; the resulting skill improvements that came about were well worth it. As was the promotion to Sergeant, and an offer to teach unarmed combat to the new recruits. Let’s see – an opportunity to demonstrate that he was more skilled and competent than younglings twice his size, in a format that pretty much guarantees that at least one of them will call him out, and he’s encouraged to make an example of them? It may not have been destiny, but it was certainly a fantastic way to pass the time until then. For two years, ‘Sergeant Halfman’ pounded the lesson home into eager, overconfident young heads, that bigger wasn’t always better and underestimating your opponent, for whatever reason, was a good way to get you and the rest of your squad killed. It was, for him, a very satisfying position. It’s a truth, that after a certain point in learning a skill, the only way to improve further is to teach the basics to others. This position did, indeed, allow Jakkin to refine his basics with new eyes to the point where he was better than before he began teaching the raw recruits. But over those two years, he had to admit that was all that improved. While he was enjoying his role, he felt that he was beginning to stagnate, and one doesn’t meet one’s destiny while standing in place. Speaking with his superiors, Jakkin requested a return to a field position. His superiors were entirely agreeable – asking him to finish one more training class. When that one was finished, however, he was asked to do just one more; due to the increased recruiting that was underway, they were short on training staff. After the third such delay, the diminutive warrior became certain that his use to the Red Brigade as an important object lesson and competent instructor far outweighed anything he could do as one more sword in the field, and he began for the first time to have thoughts of leaving the Brigade to seek out his destiny elsewhere. As the end of his second five-year tour began to loom, he cashed in his banked training hours the Brigade provided their veterans and sought out the Divine Dojo, getting in the advanced training the Brigade owed to him and looking for new opportunities where his chance to advance – and, incidentally, score some of the loot to be found amongst the monstrous races – could be realized. Last edited by Jakkin Longshanks on Sun Aug 26, 2018 3:11 pm, edited 2 times in total.